Seven-year-old Sami* puts a toy gun to his younger brother’s head. He play-shoots his other siblings as they cower to the ground. Pulling out a phone, he points to a photo of a soldier: this, he says, is who he wants to be when he grows up. Sami has seen nothing but war for most of his life. While the past is already written, the future is not. While war cannot be undone, its after effects can be ameliorated through education and support. 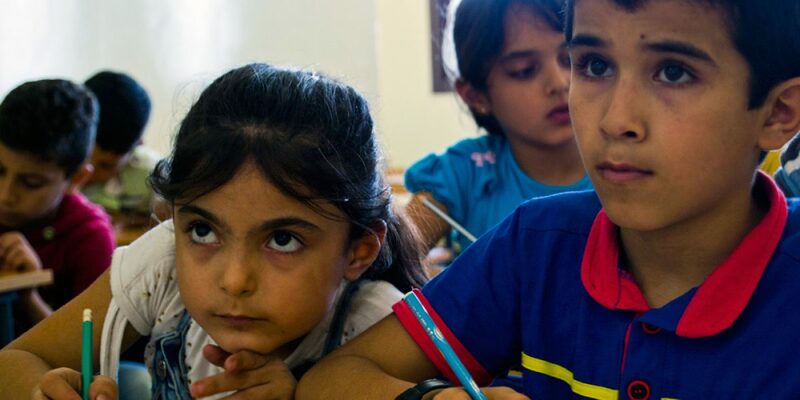 The JRS center in Jbeil serves nearly 500 Syrian refugee children, including providing psychosocial support to children through Peace Education classes. All of the children at the center have been touched by war, with mortars and bombs a daily risk. Some children have experienced violence in the home, and most currently live in unsuitable or overcrowded homes. “When the children first arrive to the center, their ‘bad behavior’ is a direct result of the trauma they have experienced,” said Majed Mardini, a Syrian teacher at the JRS Jbeil center. Many children could not access education in Syria, primarily in the villages, as various armed groups occupied the schools. Even now in Lebanon, the children live an uncertain and transient life. Children move with their families, transition to new schools, start working, or even get married. “You may see them today, you may not see them tomorrow,” says Syrian refugee and English teacher at the Jbeil center, Catherine Mora. In the same home as Sami is five-year-old Sabeen*. Through the crack in the door, the JRS home visits team can see her hiding under a blanket crying. “She is sad because she misses her cousins who left here to try to reach Germany. We don’t know if or when we’ll see them again,” the mother explains. Thus, in the center, the staff tries to create safe space and community for the students who left everything behind. The center organizes various activities to help the children cope with their past and present situations. The center even created puppets with which the children can act out some of their personal experiences in a group. The staff at the center have seen a huge improvement in the children’s demeanor since the start of these programs. “The children are happy here. When you tell the children it’s vacation time, they are so sad. They don’t want vacation. Schools is the only place they have fun and the only place they’re at peace. They don’t want time at home, because time at home may mean time in the street,” Mardini explains. The center also supports the children’s families psychologically by visiting them in the home and listening to their needs. Furthermore, the center organizes awareness-raising sessions for parents, including how to treat their children and avoid violence in the home. Looking ahead. Each child’s experience is unique to his or her past. Some are at the center three years and only talk about returning to Syria. Others are older and are thinking about what the future holds – finding a job or going to a university.